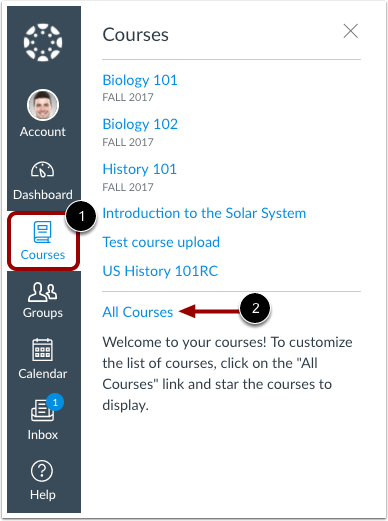 After logging into Canvas, you can view your current courses. 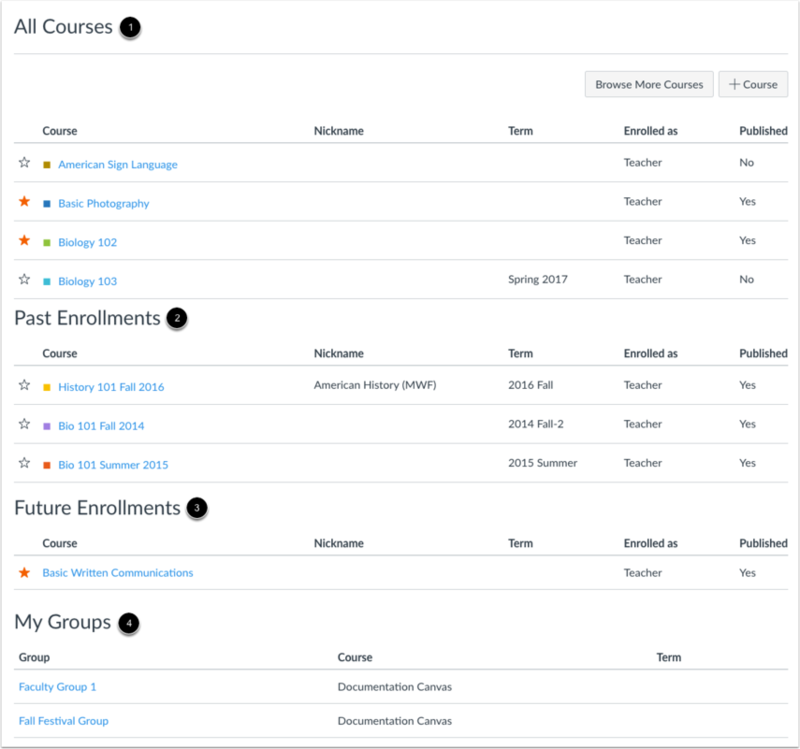 You may also be able to view past and future enrollment courses in Canvas. Note: Some institutions may restrict the option to view or access future enrollment courses before the start date and/or access concluded courses after the course has ended. Courses are organized into All Courses , Past Enrollments , Future Enrollments , and Groups . Courses that are available to you are listed in blue text . These courses have been published and include a link to the course. To open a course, click the name of the course. Courses that are within the current term dates but are not yet available are listed in black text . These courses have not been published. You can also view any nicknames you have created for courses . If a course includes a term date , the term date displays next to the course name. Each course includes your enrollment status . Statuses can be student, teacher, TA, observer, designer, or a custom role as created by your institution. In the All Courses section, you can customize the courses list and mark courses as favorites . Favorite courses display in the Card View Dashboard. Courses under the Past Enrollments heading are courses that have concluded but are still available as a read-only archived course. Prior users can view course material and grades but cannot submit any assignments. Note: Some institutions may not allow past enrollments to display in the Courses page. Future Enrollments are courses that will be made available as part of an upcoming term or specific course start date. Future courses may be published or unpublished. However, some institutions may restrict instructors from accessing courses before the term begins. If a future course does not include a link , the course cannot be viewed until the term start date. If a future course does include a link , you can access the course before the term start date. Note: Some institutions may not allow future enrollments to display in the Courses page. If you are enrolled in groups, the Groups section displays any groups within your current courses. You can view all your groups in your groups list. Previous Topic:How do I view grades in the Dashboard as an instructor? Next Topic:How do I view my instructor groups in Canvas? Table of Contents > Global Navigation > How do I view all my Canvas courses as an instructor?